Posted on December 10, 2016 by Kate Nakamura / This entry was posted in New Products and tagged davinci, davinci dry herb, davinci IQ, dry herb vaporizer, IQ vaporizer, premium vaporizers. Bookmark the permalink. Following the much-loved Davinci Aspire vaporizer, the Davinci IQ is Davinci’s newest vaporizer, and by far the best one yet. The IQ is a completely new design, taking a sleeker, more minimal approach to the handheld vape while maintaining the Davinci quality we all know and love. This sleek new design also includes new upgraded parts, including a replaceable 18560 battery, smart path technology, and a ceramic zirconium bowl, mouth piece, and vapor path, which greatly improves the purity of the vapor’s taste while using. 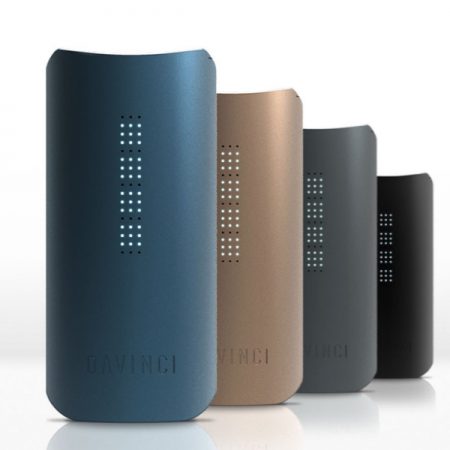 There are a lot of things about the Davinci IQ that make it one of the best vaporizers ever sold. First of all, the quality of the materials used is unmatched. Zirconium is a highly durable material that will not break easily. It essentially has the strength of steel while maintaining the cool properties of ceramic, which is why some refer to it as “ceramic steel.” It has a very high temperature capacity without getting hot, which make it so the piece will not overheat and will last a very long time even with constant use. In addition, the all-zirconium air flow path makes a perfect setting for the vapor to travel through while not disrupting the flavor and purity of the vapor. This way, you get the fullest, truest flavor of your herbs instead of tasting metal or other materials. Another groundbreaking feature of the IQ is the smart path technology used in the device. The IQ comes with an app where you can manually control your own vapor patterns which controls temperature and airflow, creating a personalized vaping experience for every user. You can even save your vapor paths for future use. The sleek LED lights that go along the front of the vaporizer light up to show you the different settings and temperatures you can use to create your personalized vape session. User reviews are truly going wild over the Davinci IQ. Perhaps the most outstanding feature of this vaporizer that puts it above and beyond other vaporizers on the market is not only how easy to use it is, but how personalized you can make it. Vapers are raving about the smart path technology, saying that it makes for a vape experience that yields amazing results. The IQ is easy enough for a first time user, and powerful enough to impress even the most seasoned vapers. The parts of this vaporizer work beautifully together to make a very easy-to-use and efficient vape. The oven where you put your herbs is a perfect size and is also made of zirconium. Inside the oven is a zirconium “pearl,” which is an innovative new technology that efficiently heats up your herbs from all sides, producing an even vape and major clouds. 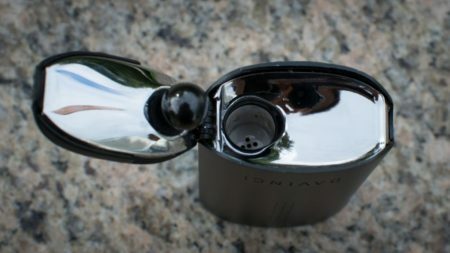 Along the air path, there is an extra removable chamber that the vapor passes through, called the “flavor chamber.” This zirconium chamber is included in order to both cool down and ensure the flavor integrity of the vapor. It is also an extra handy piece that can be used to further enhance flavor because you can actually put extra herbs inside, so that the vapor travels through your fresh, flavorful buds, enhancing the flavor without cooking the herbs inside the flavor chamber. Never before has dry herb vaping tasted so good! 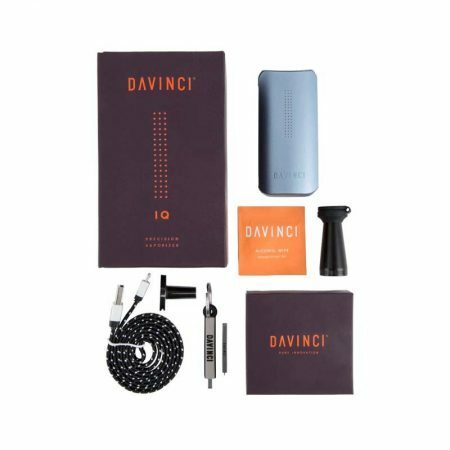 Besides the vaporizer itself, there are some handy tools that come with the purchase of the Davinci IQ. Inside every box there are 2 zirconium mouthpieces — one flat and one extended, so you can choose which style you like best. Also included are a micro USB charger, an instruction manual, a small container for storage, cleaning wipes, a cleaning brush, and another small cleaning tool for clearing out the air path.